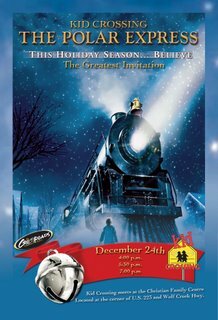 On Christmas Eve Kid Crossing kids see clips from The Polar Express as they learn that "sometimes seeing is believing and sometimes the most real things in the world we can't see." The greatest gift of Christmas is all about choosing to believe, it's all about faith. Do you have family Christmas Traditions? Check out this article to find traditions your family may enjoy. It's not too late. Check back regularly for more updates at the Crossroads website. We have recently changed our vision statement from Winning Kids to Christ and Growing them Spiritually to Partnering with Families to Win Kids to Jesus and Grow them Spiritually. Over the course of this last year the Kid Crossing leadership has begun to understand the necessity of partnering with families. We focused on that at our Main Stage production in June, I wrote about it in my blog, and we've talked about it at leadership meetings. This partnership will not happen overnight. As much as I want it to happen NOW (those of you know know me well know this) it will be a process. Several events recently have shown me that while we are saying we want to partner with families we are still not looking at every activity we do through "Family" lenses. My goal for the next year will be to train Kid Crossing leaders and volunteers, myself included, to always ask "How will this affect the family," in all we do. The KC leadership team is currently reading the book Transforming Children into Spiritual Champions by George Barna. This is an amazing book. Chapter 6 has really hit me in regards to Family Ministry. Barna is describing effective churches and says on page 99 " ...the resources used by the church in its ministry to young people are designed to prepare parents for greater effectiveness, to advance existing efforts by the parents, to serve as a catalyst for new developmental ventures attempted by the family and to enhance the quality of approaches and exercises used to mature children's faith." I absolutely can not believe it! Christmas Eve is only 1 1/2 weeks away. This is a very exciting time for Kid Crossing. Not only is Christmas the biggest event of the year for kids, but as a church it's an even BIGGER event. It's a chance to share the real meaning of Christmas with kids and their families. This year Crossroads is having a Christmas Eve Service. Statistics tell us the Christmas Eve is now the most attended service of the year. That means we have the potential to connect a HUGE amount of kids with Christ. And that's what we're all about. Partnering with families to win kids to Jesus and grow them spiritually. I am really excited about how our Kid Crossing Christmas Eve services are coming together. We've got some awesome cards that will go home with kids as invites to our service (see above) thanks to Pete Bishop, our all things tech guru. Also, thanks to Pete's creativity we are theming our evening for K-5 kids and probably 3 yr. - pre-k kids off of the movie The Polar Express. It's a movie that most kids will connect with instantly, either because they've already seen it or just because it has great kid appeal. It's going to be an incredible night in Kid Crossing! I've met some very incredible people in the last few weeks. One was Heath, the plumbing manager at Lowe's in Adrian. Now, Lowe's has always been one of my favorite stores, first when we built our house, and now for all the cool things I can find for Kid Crossing props. Last Friday I walked into Lowe's attempting to invent free-standing sign stands that look similar to road signs. I was looking for umbrella stands (the kind you get for the big outside table umbrellas) to use as the base. The middle of October is apparently NOT the best time to find patio furniture type stuff, at least in Michigan. The guy I asked thought they might have one. When I told him I needed 14 he just gave me a funny look and shook his head. Back to the drawing board.... Earlier I had toyed with the idea of using pvc pipe somehow, so off to the plumbing department I went. I stood there looking at the various connectors for several minutes hoping to be divinely inspired or something when Heath (I looked at his name tag) came over and asked if he could help me. With a laugh, I said that I would be extremely happy if he could, but I honestly didn't have much faith in that possibility. I explained to him what I was trying to do and even drew a little picture in his notebook. He thought and looked for a few minutes and to make a long story a little shorter, came up with a completely new design that was pretty brilliant in my eyes! But that is not the end of the story. He counted out and loaded into my cart all the connectors and caps I would need and then we had to get the actual pipe. He had mentioned something about cutting down the pipe so it would fit in my car, so when he started pulling out the pieces I asked him if he could cut it for me. He kind of hesitated, then slowly said He could... (For each stand I needed six 6 inch pieces and one 4 ft piece.) And he did it! Not with some fancy power tool, either. He used hand clippers to cut each of those 1 inch thick pvc pipes into what seemed like a million pieces. And THEN...he took me around the store and helped me get the other hardware I needed to attach my signs to the poles. I left Lowe's that day very impressed and very excited! Again, I'll add pictures as soon as Brian and I are both home at night and he can help me figure it out (now that he's got our computer put back together.) and when Annette who's actually putting them together gets one completed. What an AWESOME God - Day yesterday was! I knew when I woke up before my alarm went off at 5:30AM that it was going to be a great day! All the Kid Crossing age groups flipped to new spaces throughout the CFC and now down into the Lenawee Christian School Cafeteria. Last week at the open house the areas looked really good. This week with kids and volunteers filling the spaces they looked GREAT! Sure, there were little glitches here and there, but over all it was a fabulous success! I can say is Thank you GOD! What a feeling to walk (and jog - there's a "short" distance to reach the K-5 kids in the cafeteria ) through the halls, see the smiling faces of the kids and to see the volunteers interacting with the kids with lots of love...I couldn't stop smiling myself. On top of the Flip, Crossroads kicked off the "Best Question Ever" series, based on Andy Stanley's book by the same title. Advertising pays off, because we were packed! I haven't seen official numbers yet but I'm told we were around 1400 between both services (we've been averaging close to 1100 since Sept.). At the 11 AM service we had 87 kids and that doesn't count adults and junior high helpers in Kindergarten - 5th grade! Yeah God! I hope to put up pictures, just as soon as I can figure out how (or get Brian to figure it out for me). Another huge thanks to everyone who helped make this an incredible day: Kid Crossing Volunteers, Amplify Team, Set-up and Tear Down Team, Ushers and greeters, Alpha Omega, and all the others I don't even know about! Thanks guys! You made a difference in a lot of kids' lives for eternity today! Flip Open House a Success! Our Flip Open House was AWESOME!!!! The bar was raised in every area, as far as appearance, and I think programming as well. I am so excited to see what it will be like next Sunday with kids worshiping and learning in that environment! There were so many people that worked together to pull this move off! Kid Crossing leaders, coordinators, and volunteers, the tech team, the set-up/tear-down guys...everyone was amazing! Thanks to EVERYONE who had a hand in this. Know that YOU have had a part in leading a kid to Christ and growing them spiritually. It doesn't get better than this! So, if you're reading my blog, and have an interest, what would you like to hear from me? Maybe I'll try to be a little more eclectic (although I don't think I'll be writing on Famine relief in Africa - Brian). Even as I'm typing this I'm starting a list in this cool program - List Pro - on my Axim with some ideas. This past weekend we focused on Families and how Parents can/should be/are the major spiritual leaders and teachers for their kids. This is something that even Brian and I are working to become better at with Micah and Hannah. As with everything else in life, I don't think we will ever stop learning how to be better parents and better spiritual leaders for our kids. Of course the biggest question is How do I do this? What tools are available for me, as a parent, to assist me in teaching my kids about God? In a recent conversation with a friend who has two kids under 6, she said "I've seen a lot of devotionals and stuff for families, but it seems to be geared mostly towards older kids." We have had that same experience. I bought a really cool family devotional book that had a Bible reading, a story, questions to discuss, and even some activities to do. However, the stories are more about older kids. Our 6 year old mostly listens. Our 3 year old is usually off in her own world. I would like to pass along something that has really helped my husband and I feel equipped in spiritually nurturing our 10-year-old son. It's a tool called the Family Times Virtue Pack, produced by FamilyWise Inc. It is patterned after the verse in Deuteronomy 6 that talks about teaching and speaking with your children about spiritual things while doing the days' activities. It focuses on one virture per month's packet and all the facets of the packet highlight that virtue. We have really found it helpful because it makes the work of nurturing our child spiritually possible and practical. Although our son is 10 and I worked in the children's department at our church, my husband and I did not feel we could equip him with the tools to make his faith real, and so we were doing what our parents had done: passing our son off to the church and hoping he'd get what he needed there. All the while though, we were feeling that time was slipping away and that we were not seeing what we wanted to see in his growth. But we felt helpless to do anything different than had been done with us: give him to the "professionals". When we discovered the FamilyTimes, we felt empowered immediately. It is so simple to use! It gives us something to talk about over dinner (a short 5-10 min. discussion starter), something to read at bedti (i.e. a Scripture story), a cd that has a radio drama for our son, encouraging tips for us as parents and a song about the virtue of the month for us all to worship God with, as well as encouragement cards to write on to affirm when we see our son is grasping and integrating what he's learning into his everyday life. Although we've only been using these for 2 months, we have seen a dramatic increase in the number of spiritual discussions this material is sparking in our home, even when we're not using the specific material. We now engaging our son in discussions about thethings that really matter in life. It's not overwhelming, so he doesn't feel he's getting "preached at" and it hits him where he lives. Amazingly, it also hits us where we live too, providing us with opportunities to practice what we're teaching our son in our own livesIf you go to familywise.org, you can go to their online store to purchase them. We get ours delivered directly to our house each month!" The exciting thing is that we gave away several of these Family Packs at our Festival of Families. I bought one for myself, and although we haven't started using it yet, I definitely intend to try it, even more so now from this great testimony! If you're interested in a great resource for your family, check out the family packs at the FamilyWise Store! We learned this really cool statistic during a conference session presented by Reggie Joiner of North Point Community Church in Atlanta. CM volunteers have on average 40 hours each year to influence a kids life. Parents, on the other hand, have an average of 3000 hours a year to influence their kids' lives. That's a pretty HUGE difference and we wanted to make that HUGE impact on Crossroads families. So we made two cup towers - pyramids actually, one of 4o red plastic cups and one of 3000 plastic cups. Now let me tell you, the theory is good. The reality was a whole beast unto itself. I tried several ways to hold the cups together, so they wouldn't fall apart when moved, and the most stable way was to hot glue each cup. In the end the 3000 cup pyramid was made out of 3 sections, each with 7 layers (think like a snowman). (And yes if you do the math it was a few more than 3000 cups.) It took a total of 16 hours, only 3 of those I did not have a hot glue gun in my hand, and approximately 30 man hours, to build. The thing ended up being 7 feet square and 9 feet tall! That created the whole issue of how to get it out to the front of the stage (trying to get around 3 seperate sets). Finally we had about 6 people carry it behind two sets and out between 2 sets, with the top layer being added at the end by the Jester. I was behind the stage, but it was fun to hear the gasps as people started to see it come out! I've got to say it made a HUGE impact! You can see pictures on the Crossroads website photo gallery. But what really made the whole building experience worth it, was seeing the guys jump off the stage and into the pyramid after everything was over. (I saved the top layer as a souvenier.) I've laughed more in this last week than I have for a very long time. But don't miss the bottom line here: The 40 hours we, as children's ministry workers, have a year with kids is a big deal. But.... the 3000 hours we, as parents, have with our kids will make the REAL difference! It's official, the Festival of Families was a HUGE success. First and foremost I have to give thanks and credit to God, for the inspiration, the guidance, the people, and the protection (I've never prayed so hard in my life about plastic cups!) Secondly I have to say THANKS to all the staff and volunteers who put an incredible amount of hours and effort into making the Festival the incredible event that it was! Pete Bishop, our tech guy, was amazing, remixing music, writing raps, creating video, etc. We couldn't have done it without him. Then there was the stage crew who began setting up the auditorium Friday night, until midnight, and then were back again at 8 AM Saturday and they worked most of the day. Of course then there were all the people who handled those red plastic cups and glue guns....you guys have my thanks from the bottom of my heart. If you don't know what I'm talking about, read the plastic cup blog entry! My children's ministry volunteers who actually presented the service did a fine job! All the work Amanda Iott, the other Kid Crossing director put into making it a great day, and my friend and great helper Annette Armentrout who kept me from going too insane, and doubled as my personal secretary for a few days. Ben Mitchell, is a great guy, who humbled himself enough to wear a Jester costume, complete with green tights, while parading about on the stage, both in video and real time! Music, skits, kids parts, all happened to praise God and lead families to work towards a deeper spiritual commitment together. I keep thinking of more people I could add, but then I'd be at this all day! Just rest assured I appreciate each and everyone of you from those who helped for hours, to those who helped for 30 minutes! Each piece fit together to create a successful day! It was a truely AWESOME day! There are pictures on our web site gallery. You won't want to miss them. We received a lot of great comments. One from an older gentleman who said it was the best children's service he'd ever seen. My personal favorite was from one of the little girls in my 3 year - pre-K Wednesday class who ran up to me and said "I liked you on stage!" Hey Everyone! This coming Sunday, June 5, we (Kid Crossing) are taking over the auditorium and main stage where we'll be presenting a Festival of Families. And if you don't already know, it has been quite a ride to get here! There's been a whole slew of people working to get this service ready, from Kid Crossing volunteers, to main stage crews, to rappers, and our ever faithful tech guru - Pete Bishop. Between us we have designed sets, written scripts and raps, choreographed music, advertised to the community, etc. etc. etc. If you're in the Adrian area this is one Sunday you will NOT want to miss! We (the Kid Crossing Leadership team) have been challenged several times lately about how we can better incorporate the family into Kid Crossing and parents into the lives of their kids. It often seems that parents leave their kids' spiritual development to the church. 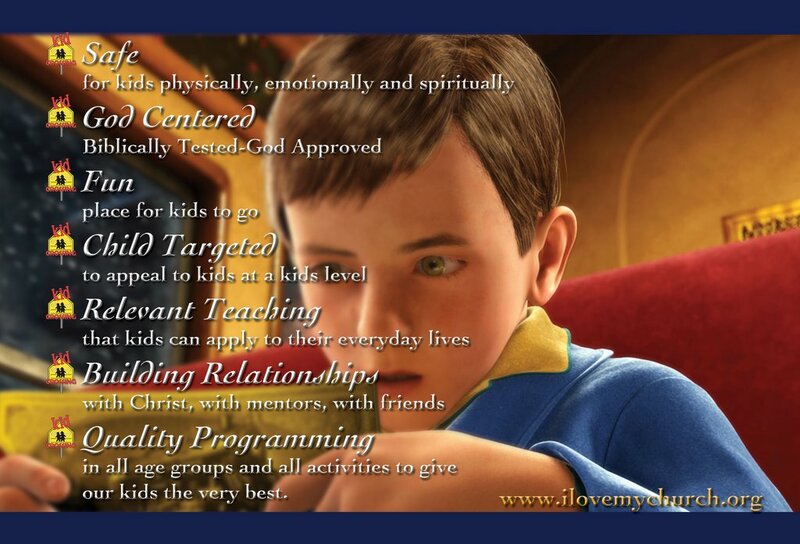 We want to re-educate parents and families so that they become the spiritual leaders and teachers of their kids. Kid Crossing wants to be a partner with families to help parents' efforts in laying down a spiritual foundation for their children. We are going to be working over the next year to incorporate more tools and information for families to assist them in taking more of an active roll in their kids development. Let us know if you are a parent/guardian and would like some specific info. Or if you have any great ideas that have been useful to you in your family share that with us so we can pass it on! (And if this is a little jumbled today it's because I had 4 hours of sleep last night and a gazillion interuptions writing it - so my apologies:) ). My name is Shari Glass. I live in Onsted, Michigan (which is in the SE corner of MI) with my husband Brian, kids Micah and Hannah, 1 dog, 3 cats, and 1 hamster. We've lived in this part of MI since 1996. I grew up in MD, CO, and VT (so why am I in SE MI?) I taught elementry school in small, private, multi-grade schools for 6 years and then retired to be a full time mom. We are members of Crossroads Community Church in Adrian, MI and that pretty much sums up our life! I am part-time staff at Crossroads as one of the Kid Crossing (Children's Ministry) directors. We have fun, creative, relevant, Biblically based programs for the kids of Crossroads. It's a blast, and there's nothing more exciting than knowing you played a part in leading a child to Christ. In my free time (what's that?) I like to scrapbook and read. And I love horses. My son has recently been taking riding lessons which gives me a small horse fix each week. I also like to garden, but we haven't yet gotten our veggies planted for this year. I know it's true for me! Today I was feeling overwhelmed and time was running out for a project I needed to get done. My natural desire at times like that is to just throw it all up in the air and not do anything. But I didn't really have a choice. I thought about that line "the attitude you choose is the attitude you use." My first thought was that I didn't want to choose a good attitude! (and that's not the first time I've thought that.) So, I went and took a break - actually I took a nap - then I got up and wrote two permission slips, read and edited a script, and now I'm even blogging! And I feel so much better about it all. I guess my point here is that we need to choose our attitude. And if we can't choose the right attitude, maybe we need to take a break, or do something different for a bit. Take a nap! So, maybe you don't feel like jumping around during the songs in Children's church - what's your attitude? Try looking at it a different way - you might discover when you choose a different attitude, it's a lot more fun. So the lesson doesn't get you excited? Look at your attitude. Then take another look at the lesson. Sometimes we get an opinion about something and decide that thing is bad or won't work. I'll admit to getting stuck in that rut on more than one occasion. Try changing your attitude. I can guarantee it will change your outlook and quite possibly your opinion. The attitude you CHOOSE is the attitude you USE! So, here is my first official entry and it is a test. Because I don't even know if it will work, so here you go Brian.